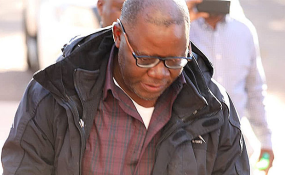 The US government has condemned Zambian authorities for handing Tendai Biti back to Zimbabwe following the embattled MDC Alliance co-principal's failed bid to seek asylum in the neighbouring country Wednesday. Biti was among opposition officials and activists targeted in a widely condemned state crackdown on opposition leaders linked the violence that erupted in central Harare over a week ago. Angry MDC Alliance supporters violently protested a poll outcome that saw Zanu PF post a thumping victory over the opposition. The former finance minister skipped the country through the Chirundu border post on Wednesday morning but his application for asylum was turned down by Zambian authorities who felt its grounds were "weak". In a statement Thursday, US Department spokesperson Heather Nauert said the superpower was "deeply" concerned Zambia denied Biti asylum, even going further to defy their court order barring the Zimbabwean politician's deportation. "We are also deeply concerned that Zambia chose to hand over former Minister of Finance Tendai Biti to the Zimbabwean authorities, and in the face of a reported Zambian court order blocking his expulsion from Zambia," Nauert said. Biti was granted $5000 bail Thursday with stringent reporting conditions.